I used to live in an apartment complex in the suburb of New Farm that had quite a culture to it. One of our co-tennants insisted that it felt like ‘Melrose Place’. The rest of us were pretty sure that it was about as close to ‘Tales of the city’ as you could get in Brisbane. Transvestites, quite conservative men in the top floor, odd princesses coming in and out. John the guitar repair guy often strumming his creations late into the night, only to be seen reading the newspaper while sitting on a tiny 60’s garden chair the next morning. Lawyers, PR people, photographers, opera fanatics… we had the lot. I’m sure you get the picture. It was a bit of drama, a bit of fun, and a whole lot of interesting. The complex itself was in a U-shape with a sizeable mutual courtyard that nicely lent itself to lots of events and parties. One of those events used to be the cinema nights that I would run from time to time. It was called ‘Cinema Elron’ after the name of the building – Elron Court. The complex was constructed in the 1930’s to a largely art deco design style. It wasn’t ‘pure deco’ as apartments near by – such as Coronet Court are, but you could never mistake it as being built in any other era. Naturally, on a few occasions we decided that film Noir would be the perfect accompaniment to the building’s interesting and odd history. While I was stumbling through the disorganised mess that is the hard drive of my Mac, I came across a few of the old posters I had designed. The movies for the cinema night were usually voted on, on the night. But people were expected to nominate films to be chosen from. The first time we did this everyone scratched their heads and made all kinds of confused noises, feeling awkward about nominating a film, as they feared they might be forcing everyone to watch their personal favourite – and everyone would hate them for it. As such I got no nominations. The first poster was simply just a way of making sure everyone in the complex knew the date, and knew what was going on. That way we could avoid having that awkward moment when you find yourself walking out your front door and finding 30 people on your front step. But after that, the posters started to represent the next cinema night’s theme. 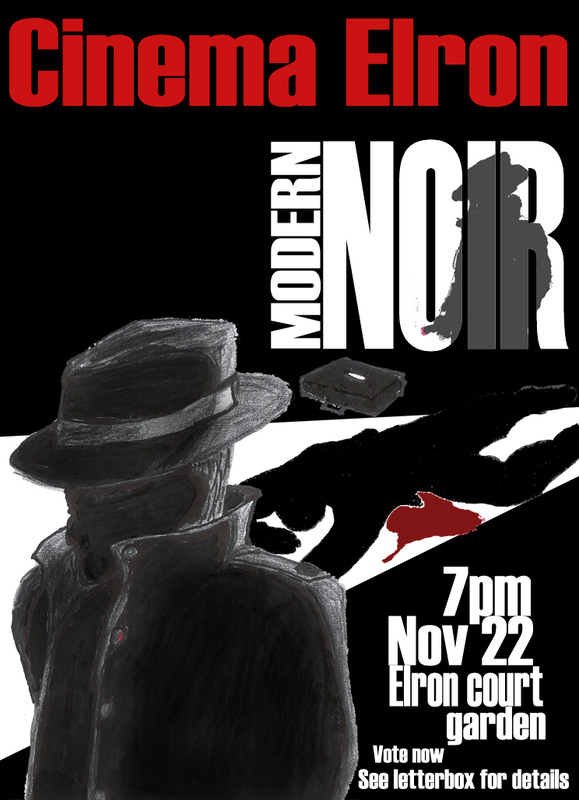 In the time I ran it, Noir came up twice. 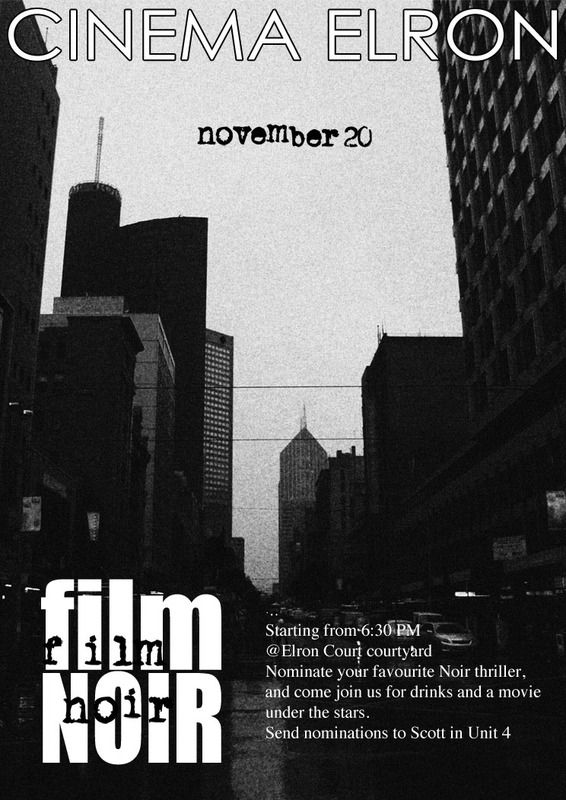 The first time was when we ran a ‘Modern Noir’ theme, where we tried to get everyone to nominate their preferred post 50’s Noir film. Later, we had another night where we ran a traditional Noir night, looking for nominations for Noir films across the whole spectrum. It also reminded me that I promised a print of my posters to the New Farm historical society. There were a few posters in total. But I felt the film Noir ones might be of the most interest to the Typosphere/writer/typerwriter crew I mostly blog this towards. Half way through setting up one of my cinema nights. July 11, 2012 in Cinema Elron, Elron court, film, movies, Noir, posters, typecast, typewriter. ← Photos and thoughts…. n’ stuff. “I was getting a little slow in my old age. The street looked familiar, but I couldn't place it at first. I kept scanning it for some landmarks buried deep in the dark and cobwebbed corners of my rapidly fading memory. That tall one on the left looked like the IOOF Building. There's a coffee cart near the entrance at the base of this building and Lev makes the best latte this side of Milan. Since Pete retired, that is. And I think that's the Galleria Building in the distance beyond on the left. Used to belong to The State Bank before they folded. Now it's Commonwealth Bank's headquarters. For how long, nobody knows. Even a giant can fall. And I think I can see the lights of a tram in the distance. This is the last town in the country that still runs street-cars. I'm gonna miss them when they're gone. The W-Class trams have pretty much been phased out to be replaced with these soul-less tin cans that are churned out in Sweden. Or is it Austria? Did I mention my memory's going? Nice photo. Makes Melbourne look like a noir-town. I used to work in Collins St and walked down that stretch of Elizabeth St for ten years until January this year when I changed jobs. Sounds wonderful. I think viewing a movie outside on a nice night would be very enjoyable. I knew you'd spot it. I took that photo about a year ago. Lizzy street has always been pretty nasty, especially down that corner. I remember watching 6 plain clothes cops kick the crap out of a member of the Collingwood football team, after he fired up at them when they busted him urinating on the footpath. You've got the right entrance too. Do you remember that just back from this entrance there used to be Melbourne's nastiest public toilet? I miss Melbourne. Shame about the W class though. Always been really enjoyable. We had to phase things down a bit when the yard filled with about 60 people on one of these. 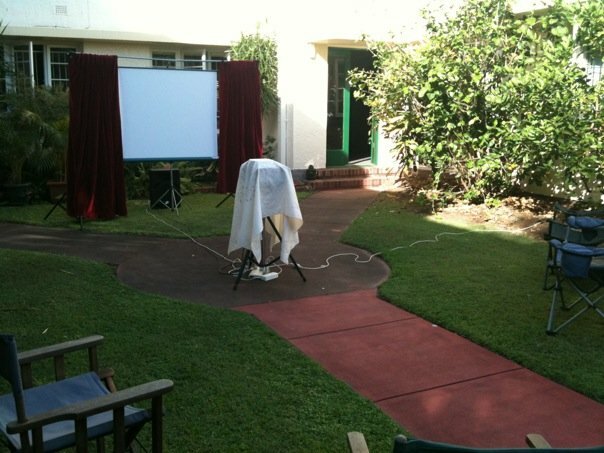 I still have my projector and my screen, and come summer I might end up just setting it up in our yard for a few people. But the feel was unique at Elron court. Yeah, some people really don't like Collingwood. I gave up on them back in 1981 when they lost their third Grand Final in a row. And that nasty public toilet is still there. I used it once…back in 2005. Never again. The W Class trams still run down Chapel St and there's a nicely restored one that does the City Circle run daily. Great posters. Had I lived in your apartments, I wouldn't have been shy about nominating a film to watch. Sounds like good times and great memories. Absolutely great times. Thanks for the compliments.